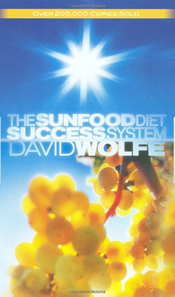 David Wolfe is the son of two doctors and as a child he had the opportunity to observe the effects of modern medicine. He noticed that most people did not get better by taking medicine and at the age of ten he made the decision not to take medicine again for any reason. Whenever he was sick he would rest and drink only fresh orange juice and found that he recovered within a day or less, whereas his brothers were sick for four or five days while taking medicine. After many years of experimenting and researching with a raw food diet and other healing techniques he created what he calls The Sunfood Diet Success System. The Sunfood Diet Success System is a raw vegan diet that contains a balanced intake of green vegetables, sweet fruits and plant-based fats. These foods make up 80% of the diet with the remaining 20% coming from other raw foods or any other foods that one feels is appropriate for them. For best results dieters should consume the main three food classes in equal proportions every day. Sweet fruits for brain and body fuel. Fatty foods for beauty and as a lubricant of the body. Wolfe addresses dieters concerns about obtaining adequate protein and says that the best and cleanest sources of protein are green vegetables, seeds and superfoods such as spirulina, bee pollen, maca, cacao beans and goji berries. Wild and organic foods are especially recommended because they contain an exceptionally high content of minerals. The Basic Sunfood Diet: Focuses on including significantly more raw plant foods and juices into the diet. Twice a week dieters may still eat their favorite meals in the evening but a salad must also be included. The 80/20 Sunfood Diet: Includes 80% raw plant foods containing a balance of green leafy vegetables, sweet fruits and fats. The All-Raw diet: Contains 100% raw plant foods. Lettuce, celery, green herbs, wheatgrass, collards, kale, bok choy, watercress, endive, spirulina, wild honey, agave nectar, cherries, berries, pomegranates, apples, apricots, dates, figs, goji berries, mangosteen, nuts, seeds, young coconut, avocado, durian, olives, sprouts, flowers, mushrooms. The following is an example of the All-Raw menu for spring/summer. Large salad containing 80% green-leafy vegetables, 20-30 almonds, dulse seaweed and an orange squeezed as dressing. Wolfe says that exercise is essential in order to thrive on a raw diet because it is the key to effective metabolism of food. Exercise is also encouraged because it stimulates circulation of blood and lymphatic fluid, which improves detoxification. Types of exercise that are recommended include swimming, weight lifting, cycling and jumping on a rebounder. Dieters are advised to exercise outside in nature whenever possible. The Sunfood Diet Success System retails at $29.95. May reduce the risk of developing chronic illnesses such as heart disease, cancer and arthritis. Dieters are encouraged to take responsibility for their role in the creation of health. Gives tips on how to eat in social situations and while traveling. Encourages dieters to keep a journal, which is associated with a greater chance of success. Acknowledges the importance of a positive attitude and goal setting. Provides specific suggestions on how to eat for detoxification, hypoglycemia, diabetes and Candida. Many dieters will experience detox symptoms to some degree when commencing the diet. Most nutrition experts do not believe that we are designed to eat a vegan diet. Can increase the risk of B12 deficiency if animal products are completely excluded from the diet. Recommends fasting, which can be dangerous when unsupervised. Difficult to eat in social situations and may increase the likelihood of social isolation. Most people do not enjoy eating a raw food diet in cold weather. May be difficult to lose weight if too many high fat foods and natural sweeteners are included in the diet. The Sunfood Diet Success System offers dieters a balanced approach to a raw food diet. One of the strong points of this program is that a transitional plan is included that will allow dieters to gradually adjust to a raw food diet while still including some cooked foods in the diet. Wolfe, D. (Ed.). (2008). The Sunfood Diet Success System. North Atlantic Books.